danger garden: Bishops Weed…declaring war, or giving up. What is a girl to do? Bishops Weed…declaring war, or giving up. What is a girl to do? I know you want to be organic, but: Round-up. This is a HORRIBLE weed, and nothing short of extreme measures is going to work here. You'll need repeated applications, probably, even with round-up. As far as I know, the only other options are to spend the rest of your life pulling up bits of it as it returns, or paving the entire yard. I can so relate to this post!!! Have spent countless hours grubbing this stuff out from amongst hostas and still, still it comes back. And if you ignore it for a season it will take over everything. Got it from a friend when I didn't know any better, what a mistake! I do have one bed of it under a maple on the side or the house, nothing else will grow there. Maybe you could get rid of most of it by putting down an inch-thick layer of newspapers with mulch on top; plant some yuccas that won't mind dry roots at intervals in SMALL holes in the newspaper. But it's still going to come up beyond the newspaper under those nice rhodendrons. I'm hoping for some good suggestions from other readers! Got it. Hate it. I grub and use round-up; still, the slightest relaxation on my part results in....well disaster. I pretend that when I retire and can devote myself to weeding I'll conquer the Bishopweed and the bindweed! We'll see! I AM RETIRED ! the damn weed still grows - it grows amongst my other flowers and I pull daily...there is no end - is there? Some grow Bishop's Weed as a bedding plant N of here! Same w/ Spanish and Scotch Broom in ABQ...not invasive here, but in NW, yikes! Sorry, no answers here. We have this plant also, but in the shade garden where it doesn't get scorched. Perhaps we underwater it because it doesn't get too invasive for us. I say "too" because it does try to move around a bit and I just pull it out. Loree, As you know I'm dealing with the same problem. But I do remember when we first moved here. It was growing all along our back fence with the Arborvitae By completely digging out the arborvitae as you can imagine a big job, than digging up a huge trench for the bamboo, the bishops weed was GONE!. Extreme ...yes, but it did the job. By the way I got my Gunnera! We live the same battle. My plan is to give it another go at removal. With a shovel and a lot of labor, maybe I can beat it! If that doesn't work, I'll give up and incorporate it into the design. Then try to contain it as much as possible. Loree, though I hate using Round-up, I keep a RTU bottle around for emergencies--my challenge now is the dreadful Lysimachia 'Andrew' , that has reverted to green and insinuated itself right up to the base of a particularly thorny rose bush. 'Andrew' will be smote (smited?? )this spring. I believe in moderation, and since my garden is 95 % organic, I don't feel too badly about employing a chemical alternative in this instance. That Bishops Weed is truly noxious, and desperate measures may be called for. I don't have this weed, but it sounds as bad as my quackgrass. the only way I've found to kill it, is to put full sheets of 10mil black plastic over it. (the plastic you'd buy to put down in your crawlspace) It's ugly - but I put mulch over it, and just don't grow anything there for two years. The black plastic prevents photosynthesis, and bakes the roots to death. (happy thought) Then...I take the plastic up - and the quackgrass is gone! nope. Flames don't work. Burned them all in our garden with vengeance !!!! Round up works, when you keep killing it every time you see one. We just took the skid steer and made that garden grass. Moved the garden over, bare rooted everything, so not to have it in the new garden, and it worked. They should make it illegal to sell this plant. Farmers were sold this plant back in the 40s as to not have to "trim" next to there houses, and it was a great ground cover. Greensparrow, paving the entire yard is not an option...the rest of my life? I think I have other plans for that. Round up it is. Yikes. I feel dirty. Jean, your story scares me! The thing that I find the most amazing is when we looked at the house there was not even the tiniest hint that there was any Bishops Weed. Did they know and hide it or was it just by chance? ChrisU, Bishops and Bind weed? What have you done to incur such evil? (kidding)...good luck. I think I've finally conquered the Bind weed...believe it or not IT was easier. DD, actually my mom grows it up in Spokane with absolutely no issues, I think it's just a "perfect storm" here in Portland. K&V, I never water mine either...but mother nature does. Linda, so glad to hear you got the Gunnera...it was so happy and healthy and deserved a good home! Did you buy anything else? Laura, thank you...I did dig it all one fall a couple years ago...I think it actually came back stronger. Wow, you make me sooooo glad I didn't add it to the garden when (for a brief period) it looked like a great little ground cover to me. How sobering that there was no sign of it when you moved in. I have no wisdom to offer, but I thank you for the public service you are doing in discouraging its use here in the PNW. Well Loree, I've noticed my BW is starting to emerge too. Now is definitely the time to deal with it. A few years ago I spot sprayed mine with a brush killer and it worked. I kept a small portion of it in a shady spot where it looks great. It is spreading slowly but not too quickly for me to stay on top of it by pulling. I say go for it. oh my! I have that plant and I've been wondering what it was! I got it from the local nursery two years ago because I'd never seen it before and needed some ground cover. It was an odd variety that was variegated with pink and green and white. I remember it spreading a bit faster and thicker than I'd intended and had to keep a close eye when I weeded every couple of weeks to thin it down for the other plants in that bed. Otherwise it hadn't been a problem. Since the re-landscaping I had rescued a sample of it when that part of the yard was torn up. I've keep two small patches of it and one potted specimen. I guess I haven't had a problem with it because it's restricted to two very small patches surrounded by pavement and block planter walls. It's been slowly reverting back to the common green and white look which I prefer. Thanks for the invasive info, now I know to never plant it in a area it can get loose from! I just read another site that said to completely dig it up, cover the ground with a tight clear heavy plastic for 4 weeks and let the sun bake it, then cover with black ground sheets and start over with new plants. This would mean one whole summer for me with nothing in my garden but if it works it will be worth it! Ugh Ugh Ugh...such a pest...I'm thinking the torch seems like the best solution (I agree about RoundUp...only as a LAST resort). I can only shake my head when I think of the times I've seen this plant for sale at nurseries. Reading these comments have been helpful, because I have the exact same problem. I'm organic, but the half life for Roundup is so short, and instead of spraying it, I'm going to "paint it on" as they emerge. Hopefully this technique will prevent overspray hitting nearby plants. I like to be as organic as I can be as well. I inherited a lovely yard with 30 years of care from the previous owner. More beautiful flowers than the average person knows what to do with. 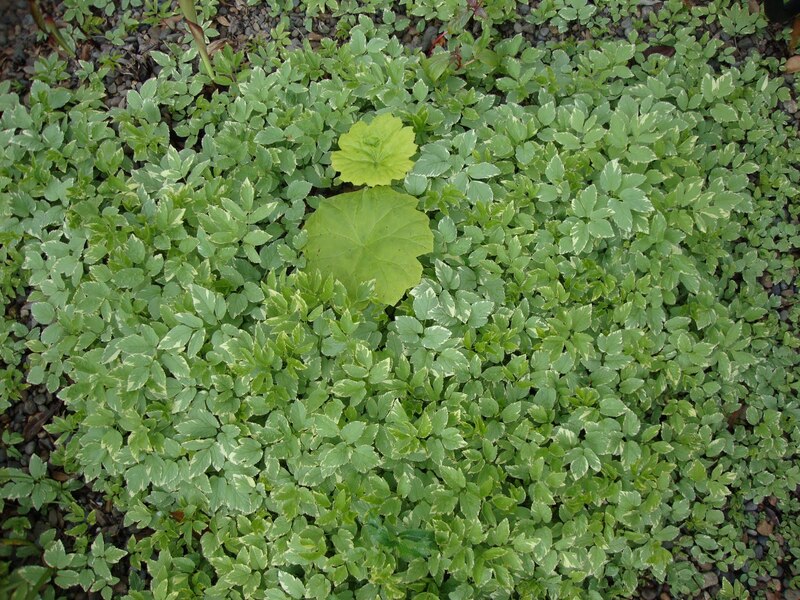 But with age she was not able to take as good of care of them, and Bishop Weed took off like crazy, covering over everything in it's path. I have declared war on it, and that's all you can do. Round-up will work with repeated applications. Don't give up, take back your flower beds. Spray it on, paint it on..whatever it takes. Cut it very short with the weekwacker, then sprayed the cut stems with Round-up. It's been 3 weeks now, and it seems to be GONE!!!! We have a terrible case of it here in Vermont. We, too, bought a house with a garden with no trace of it....until I was weeding one day and found the black plastic layer they had put down to hide it! It has totally taken over, as has the Japanese Knotweed. I think I could weed for 10 hours a day all summer and not get on top of it all and we only have a 1/4 acre. I'm just taking comfort in the fact that may of you are also dealing with this. I weeded a great deal today, and put down black plastic. I'm going to do that for a few days, turn the soil, maybe hit it with round up, put the plastic over it, and then plant something big an hearty next spring that can hopefully stand on it's own around it. Our asters and hostas seem to have withstood it. I bought a house last year that had it planted along the house, right in my back yard. It was starting to choke out my other plants, and being a 30 sf area, I knew it wasn't going to be easy. What I did was shear it to the ground this past spring and put a black tarp over it. Recently I peeled off the tarp and raked it like crazy, pulling up as many of the roots as I could. I then dug a trench at the last known spot where and piled up all the dirt in the middle. I sprayed Round Up over that pile and along the trench. Then I put down plastic garden edging and smoothed all the dirt back out, raking up as much of the roots as possible. I am now monitoring the dirt for any signs of life and using Round Up. I know that the rest of my garden is safe from any invaders and next summer I'm going to grow a vegetable garden in its place. It was a horrible amount of work, but it was the only way I could figure out how to get rid of it. I have it. The plain green variety. It came with cuttings from an antique rose garden. I actually like it, because it keeps a nice groundcover around the antique roses. No need for weeding, no fuss, no muss. But I can see how in a more formal garden it would be a nightmare. I've taken cuttings and put it as a border around our deck where the lawn can't be mowed, and it works fine. But I've also heard it's illegal to sell in 3 states because it spreads into the woodlands. Oh how I chuckled when I saw this! I feel your pain, and love how you wrote about it. I have the same problem, two varieties & an aching back from trying to get rid of it! It came with the house I bought, planted by a thoughtful neighbor when the previous owner wanted something that wouldn't need a lot of work to tend. Um...Sometime I think I can hear it growing at night...coming for me like a Trifid... The only success I've had (via pulling the darned critters up by the roots) has been short-lived, as the little buggers' roots grow like they're on steroids...like black locust trees...like violets...only violets, I like! Please tell me, "Danger Garden," did you ever conquer the evil bishop's weed? We have a terrible case of the stuff. It has taken over our formerly beautiful garden in the back yard. We were flooded during Tropical Storm Irene in August 2011 and gave up on gardening for the remainder of that year and the following. I started gardening again last summer and tried to weed the massive amount of it out traditionally--a big failure. Did the round-up work? I'm desperate! I did eventually win the battle. I spent numerous hours (we're talking about days and days) digging every square inch of the infected area by hand, going through the soil and pulling the roots. It was an arduous task but it worked! All through the following summer when ever I saw a leaf appear I would dig it out, if it kept returning a shot of round-up did the trick. I am so glad I got rid of it and I wish you the best of luck. Round up for woody stem plants at a higher than recommended concentration works. It's a scorched earth policy, but I'm gaining on it. I don't have even a single leaf any longer, I won! Also I can't imagine what it would taste like, the smell alone made me nauseous. I've found that the pretty white variegated variety morphs into the nasty, noxious green type. Didn't know it was in the same family when I bought it. (I am horrified that it is sold, even with a "Warning Label.") Keeping it contained in one area helps and is an essential first step, but I found some in another bed and wondered if it has airborne seeds? I I'm looking to buy a 1820 Cape home with lot's of Bishop's Weed in what could be a lovely shade garden. Could it just be mowed down and treated like a lawn? I am willing to do battle with black plastic, shovel, RoundUp and vigilant persistence. Looking forward to reading other posts. Oh trust me, the white variegated variety is plenty nasty and noxious on it's own, no morphing required. My mom has a bit of it planted on the north side of her home which completely minds it's manners. She's in USDA Zone 5, I'm in Zone 8. I think it appreciates the warmer temperatures and is able to get crazy. I think the seeds may in fact be airborne. Not completely sure, but it spread like crazy at our house in the two years we took a gardening hiatus (following being flooded). The root system is mind blowing. And the roots break very easily. We have yet to win the battle, but I think the black plastic will make a difference. I haven't gone that way because I don't want to attract snakes. Regardless of which methods of attack you choose, vigilant persistence will be required for sure. By the way, we're in zone 3/4 (central Vermont) and the bishop's weed grows and spreads like crazy here too. Best of luck with your battle. I have heard of seeds being an issue but since I always cut off the flowers (ugly) I knew it was that crazy root system that allowed it to spread here. Careful digging and removing of ever bit of root is what finally allowed me to win, not a method that will be appealing to most! 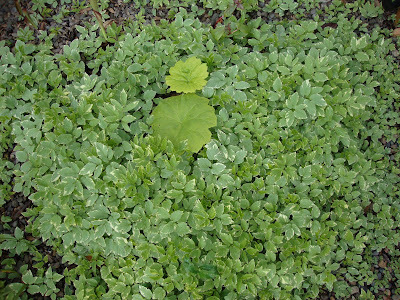 Bishops weed comes up early and is easy to eradicate in upright perrinial gardens with roundup. If it is spreading from a neighbors garden then maintain a dead mans zone to spot treat spreading plants. If you have low foliage plants like hosta with dense roots that hide the weed, then pull the hosta, go through the bare hosta roots to remove any weed roots. 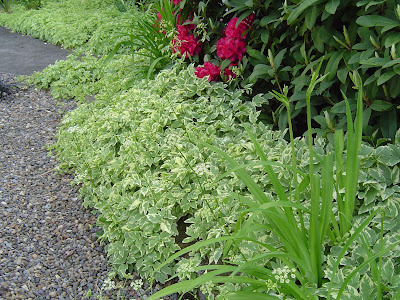 Divide the hosta, place in pots and sink the pots in an isolated quarenteened area of the yard. 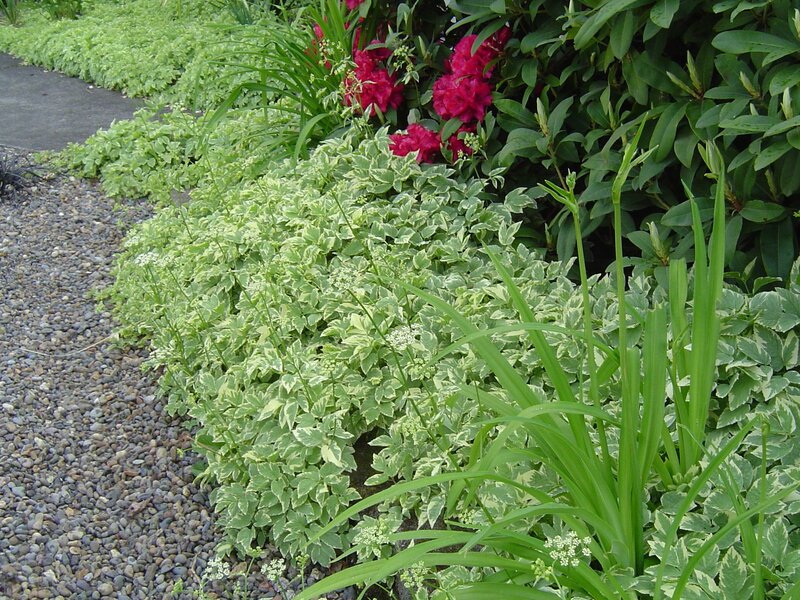 Treat the old hosta bed with roundup. 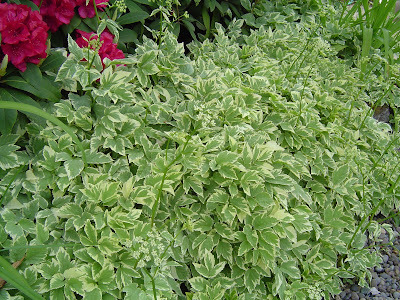 Monitor the hosta pots for any new weeds and treat new weeds with roundup. Continue the treatment the following spring. If no new weeds are found, replant the original bed. In our case it is in the middle of a perennial garden with its roots mixing with a lot of lilies and iris. I pull the ones that get tall and flower, but the root system seems to be the problem. Taking apart all of the lily and iris roots and bulbs would take way more time than I have for this problem. I guess I'm choosing between living with it and destroying all of the lilies and iris. Very sad and frustrating. I get upset on Pinterest and other places seeing people suggest this as a new plant to add to gardens...should be illegal to sell for sure. My husband put down a huge area of black plastic only to find later on that it had grown all the way under it and come out the other side....with roots like little ropes. Maddening to see people spread this pest that is killing off our native plants. I am still fighting the bishops weed, but it is more under control because I dug up and threw out the lilies and other perennials it had invaded, removing a significant amount of soil to try to get out the root system. I'm convinced the roots are at the heart of the problem. For sure, you have to attack it wherever and whenever you see it. If there were a nuclear war (heaven forbid), I'm pretty sure the bishops weed would survive alongside the cockroaches. On the edge of our yard where I don't garden, it's taken over, trying to come up in the grass. I can't use our old mulch pile for soil because bishops weed owns that too. This stuff should be illegal to sell everywhere. I inherited it when I bought my house, it is taking over so many of the gardens, have pulled it (makes it worse) dug it out but with so many plants in the garden I would have to take everything out which is too much for me to do. I have heard if you keep cutting it back to the ground it will eventually die? I won't use Round-up, had tried it in the past without success and since I am now aware of the danger it poses for amphibians, insects and us, I am done using it. Dawn dish soap, salt and vinegar. I had a serious issue with English ivy and it did the trick. I spot treated and ripped it up and it is gone.